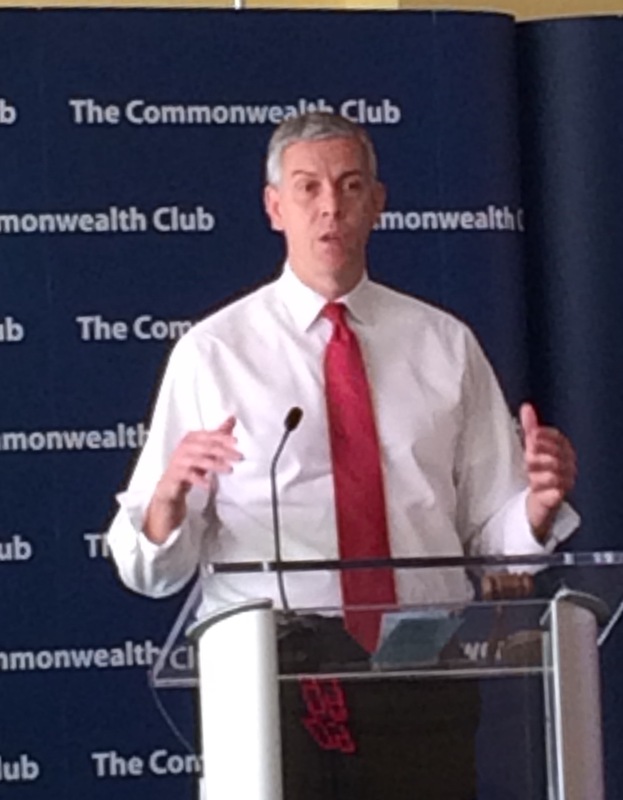 Arne Duncan sounds like a man who is ready to get out of Washington. At a recent Commonwealth Club of California program moderated by EdSource editor-at-large John Fensterwald, Duncan spoke briefly about educational gains made during his seven year term as U.S. Secretary of Education – but repeatedly and at length about the inequities and injustices that remain across the country. His frustration is palpable. All those debates about Common Core, testing, over-testing? Sideline arguments. “All we can do at the federal level,” Duncan says, “is fight for equity, excellence and innovation. Take politics out of it. Figure out how to get better faster. The school-to-prison pipeline is real; suspensions and expulsions lead to crime.” And don’t even get Arne Duncan started on gun violence. With that, Duncan stepped down from the stage. One gets the very strong impression – hearing him also say that being Secretary of Education was never something he aspired to, but he took the job because of his great admiration for Barack Obama – that he is more than happy to have stepped down from the national stage and headed back home to Chicago. I so respect this man and what he is saying. He’s consistent in his view and in his obvious mission. I just SO felt his pain and frustration. We really, really could do a lot more to raise tomorrow’s citizens. Good writing, as always. Much love, T.